Did you all watch 'The Jubilee Queen with Katie Couric' on ABC? I thought it was a fantastic documentary offering us a rare and personal interview with Prince William and Prince Harry. It was particularly poignant to hear William discuss missing his mother during the royal wedding. The Prince also revealed dealing with his wedding nerves with the help of Harry: 'We cracked some very bad jokes'; baby plans, and how he is finding married life. For those of us living outside of the US, ABC has kindly uploaded links to Youtube. Simply click below to watch. 'Kate came in with her mother Carole, and sister, Pippa. Even then she knew exactly what she wanted and had a very strong sense of style. She came in on several occasions and was an absolute pleasure to deal with'. Now two of the hats Kate wore (Yes the exact ones) are being sold through Kerry Taylor Auctions on June 26. The Aurora hat Kate wore to the wedding of William's close friend Harry Meade in 2010 and the black and white disc shaped Philip Sommerville creation she wore to the Order of the Garter in 2008. Each piece has an estimate of £1,000 - £1,500 although I anticipate the selling price will be far higher. In disappointing news William and Kate will not be attending the Epsom Derby on Saturday. This is very surprising for a number of reasons. Her Majesty has reportedly said she wanted a 'full house', the derby is the first event over the jubilee weekend and the Cambridges attended last year. I had initially thought their absence could be due to William's work commitment with the RAF but the couple are currently in London. Kate was spotted shopping in Chelsea today (Perhaps last minute pieces for the jubilee) and William was playing polo in Chester. However, we will see the couple Sunday, Monday and Tuesday for jubilee events. In honour of Prince William's 30th birthday, The Queen has awarded her grandson one of her highest orders of chivalry. 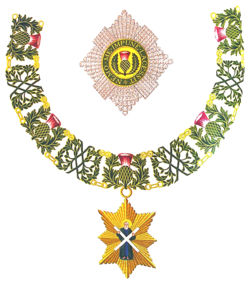 The Prince is to be made a knight of the Order of the Thistle. It is being considered a sign of William's introduction into becoming a full time royal. William will be formally welcomed into the order in a ceremony during Holyrood Week, a week when The Queen and Prince Philip undertake a series of engagements in Scotland each year. William and Kate are known as the Earl and Countess of Strathearn in Scotland. Looking forward to this engagement, I expect it will take place in early July. Clarence House announced Prince William is now patron of the Welsh Rugby Charitable Trust. I expect we'll see the Cambridges attend an event for the trust in the near future. To wrap up tonight's photo I'd like to share a photo of Kate taken outside Clarence House on the day before the royal wedding. I've never seen this exact one before. I think it captures the excitement of the day wonderfully. Sad that they will be absent from the derby. In one of your eariler posts there was a tweet that said there will be no more official engagements for Will, Kate and Harry until the jubilee so that must be an official engagement. I adored the documentary and it was a great look into the princes life. Do you know who the person is with the Duchess. It does not look like her mom Carol. Do you suppose it is Sarah Burton leaving from a last minute fitting? Kate definitely deserves the honor of "the hat person of the year". She looks great in every hat she has worn! She got me into buying hats now, too. My friends often make joke about it. Love this photo just before the wedding...she looks so radiant! Very dissapointing about the Epsom Derby though-I loved the outfit she wore last year and was really looking forward to seeing what she chose this year! :-( oh well, at least there are the other engagements to look forward to!! How can you call her 'thrifty' when she spends over $2000 on a belt and her dresses alone cost more than most people's monthly rent? I don't want to sound "defending“ Kate or any of the royal family members as these things bug me as well. However, I think, from the reports I read, Kate has been trying the best she can at her position to be as low key as possible in most of the occasions. But I wonder...how much can one really do to please everyone. Personally I think she's a very intelligent and shrew young woman who knows what she wants and gets what wants. That's actually a good quality in today's crazy world. Lovely post as always, dear! Thank you so much for the links to the videos. I was looking myself yesterday but didn't find anything. Its so good to have you back! I was wondering who the woman in the picture is that huggs kate. Any ideas? I'm so glad to find your blog!! It's so great!! Last summer I saw Kate and William, in Prince Edward Island, I was in the front row at a walk about, she is so beautiful!! The last photo is cute! I wonder who the woman is? and also the rest of the website is also very good. thanks for the update. To bad the two won`t be attending the Epson, I loved her outfit last year. I think that was the moment I started following her style. Who is the woman in the last picture, the one she is hugging? Hi Charlotte! Thanks for the post! And I was wondering if you could let those outside the uk know where to watch jubilee celebrations and especially the concert online? that would be so lovely! thank you! I live in the US and BBC America is covering the Jubilee Celebrations. I am not sure if for all the countries outside the UK but here in US, all major TV stations will be broadcasting the event. However I don't know how full the coverage will be. Thanks for the info but i live in australia :( i know abc australia is covering parts but not the concert, which is like the most important part. The concert is on channel 9 in Melb on Tuesday night. I would love to see the Katie courier doco thou hopefully I can find it on YouTube. 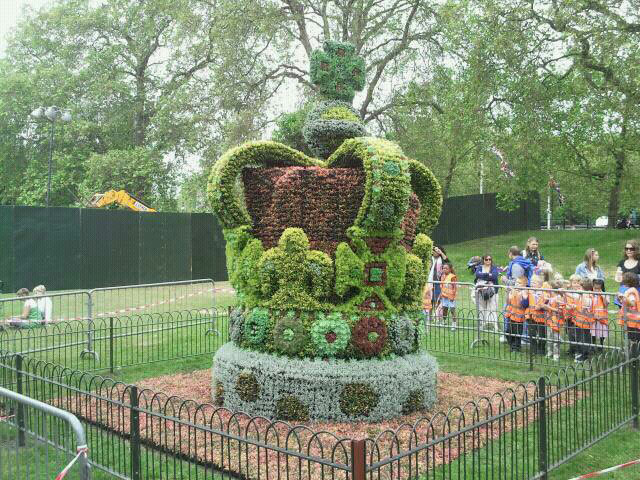 Thank you Charlotte for posting the links to The Jubilee Queen, I enjoyed watching them. Thank you all for your comments. I do feel Kate is thrifty, She's in a unique position where she simply cannot wear high street all the time, but does quite frequently. As for the very expensive McQueen belt it is highly possible she bought it with the McQueen blouse she wore to visit Birmingham. Very excited about the jubilee! Are all of you? We are having a jubilee party in the street. Everything very British. We have angel cake,batenburg cake,cupcakes with flags,cucumber sandwiches,triffle. Oh the list goes on!!! With knees up mother brown and I ho silver lining on the grammar phone. (cd player). If your not in Red, White or blue then you cant come!! s travel up and down from Angelsea to London all the time - it must be a 4 hour car journey - how do they travel> hop a copter. Anyone know??? But unfortunately there is no hint who could be this blonde woman! Thank you! I'm seriously thinking it could be Sarah Burton. Hello all. Well I just finished watching a program on CNN called the Woman who Will be Queen. It was about the beautiful Duchess and William's beloved mother Princess Diana. It was a really great program. And those who get CNN try and see if you can get the show. It gave the history (in short form) of William & kate relationship, and the relationsip of Prince Charles and Princess Di. It was just part of the julibee coverage CNN is going to have over the next few days. I can't wait until we get to see the beautiful Duchess & her Prince tomorrow. And what the Duchess will be weraing. Whatever it is she will knock it out of the ballpark. And William is going to look very handsome in whatever military uniform he decides to wear. Maybe if he wears his Navy uniform the Duchess will wear something matching him. She has done before. And Charlotte, that woman with the Duchess does not look like Sarah Burton but I could be wrong. Can't wait until your post tomorrow with the wrap up from the days activies. That is a fantastic photo of her before the wedding! I wonder who she is huhhing? You can shop for designer chanel classic bag online at Shopatmajorbrands. Here designer handbags are available from some of the top hermes birkin kelly handbags fashion brands like Aldo, Queue Up and Qup. These handbags are available in different styles which include large louis vuitton monogram canvas ,satchels & messengers and small handbags. Unique collection of omega watches online for girls here will definitely leave you spell bound. These designer find a christmas gifts are popular for their durability and styles. Hats have a lot of different functions, such as decorative, sunscreen, modeling, etc. Comments are most welcome! Constructive discussion is always encouraged but off topic or hateful remarks will not be published. We ask you use a name when posting (a pseudonym such as the name of a royal you like or anything you wish). If you do not wish to use the sign in options, simply select the "Name/URL" option on the drop down menu and insert your name, and if you wish the country/state you're from. You can leave the URL blank. If there are a large number of comments, it is necessary to click the 'Load More' button at the end of the comments section to see the latest additions. 21 April - It is very likely we'll see the Duke and Duchess of Cambridge at Windsor for Easter Service. 25 April - The Duchess of Cambridge will attend the Anzac Day service of commemoration and thanksgiving at Westminster Abbey. It's An Outdoor Adventure With the Scouts for Duchess Kate at Gilwell Park! It's a Norfolk Day Out at the Burnham Horse Trials for the Cambridges! Kate to Resume Duties Next Week, an Easter Appearance? & Black.co.uk Exclusive Discount! UPDATED: Duchess Kate Joins The Queen For Bush House Opening & A New Patronage! Kate in White Catherine Walker Floral Dress for Wimbledon Final! UPDATED: Duchess Kate in Green McQueen for St Patrick's Day!